This post was originally published by Promotional Marketing. Asda is running an in-store monster hunt using Augmented Reality (AR) as part of its Halloween promotional activity. Launching in 394 stores across the country on Saturday October 25, shoppers will be given clue sheets to guide them around the store and masks with “Monster Vision” to help them spot the mischievous Fang and Fangle hidden in the red ‘reveal' floor stickers. Once they have completed the hunt, they will be given membership cards showing they are now members of the ‘Spook Squad’. The campaign was created by brand experience agency Momentum Worldwide in conjunction with AR app maker Zappar. 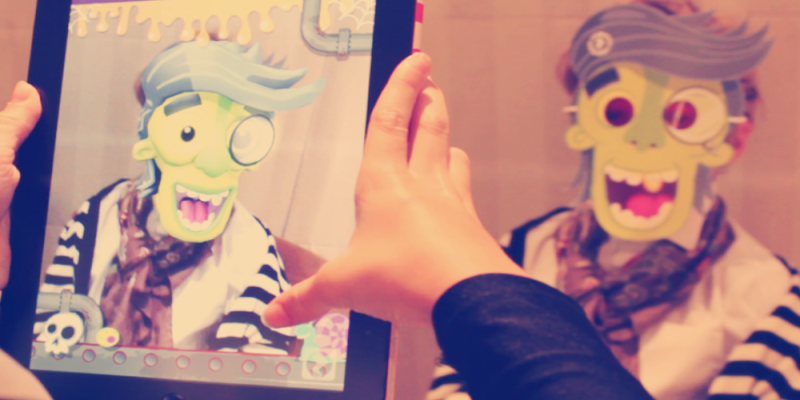 By using Zappar’s free smartphone and tablet app, parents and children can ‘zap’ the masks to reveal AR content and transform themselves into either Sir Spook or George-ina, using the “Spook Swap” function to switch between characters. Take home packs will also be available for shoppers which include four stickers that can be placed around their homes in order to create a personalised monster treasure hunt with the aim of catching new characters Fang and Fangle. Exclusive AR features include animated spooky effects, a game of catch Fang and Fangle, and a chance to take a selfie with both characters once they’ve been caught. Asda ran a similar campaign last year, ‘Big Shop of Horrors’, including an AR Horrible Halloween Hunt again created by Momentum and Zappar. Apparently, that activity saw over 15,000 shoppers engage with the Zappable elements in only six hours.